"So, What Would You Like To Know About Lake Garda?" Thinking of going to Lake Garda? There's probably a lot of things you're wondering about. No doubt you would like to know all about how to get there, where to stay and what to do once you're there. Do you wish that somebody could tell you exactly what Lake Garda is like and answer all those questions you have about it? Well, we’ve already explored the enchanting towns, lounged the tranquil beaches, eaten the amazing food, and tried the fun sports. 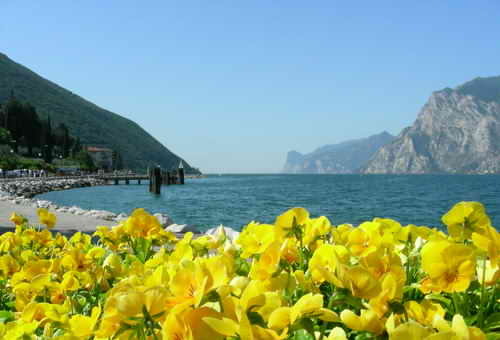 Yes, over the years we've found out just how many things there are to love about Lake Garda! And whenever we go back (which is often), there are always new gems to be unearthed by this stunning lake. In fact, we love Lago di Garda (as the Italians say) so much that we decided to put this information web site together and give you some guidance and advice on this wonderful holiday destination. There is something for everyone at Lake Garda. For young families, teenagers, singles, couples, the retired...it’s ideal for anyone. There are so many places to see and tons of different things to do. Whether you’re into sports, family leisure activities, history, shopping, or just chilling out on the beach eating ice cream and watching the sun set...Lake Garda has it all. So...Are you ready for Lake Garda to be totally revealed? Want to read what other people have to say about Lake Garda? 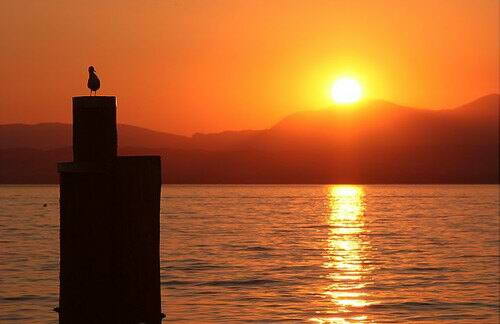 We want to here all your amazing Lake Garda stories too! Take a look at the forum and get involved in our Lake Garda community. You’ll find info here about all sorts of nice hotels, charming villas, agriturismos, holiday residences and apartments. There are so many great places you can stay at Lake Garda, so why not take a look at the accommodation you can book online as well. There are loads of really nice camp sites on the lake. Some are huge with a wealth of facilities, while others are smaller and more intimate. Many are right on the lake front and are a fantastic place for a family holiday! You will find out about how to get to this area, car rentals, public transportation and ferries. We'll advise you on what we thought were the best options for getting around. We will tell you all about must-see places and what we thought about the towns we've been to around this magical lake. This includes: Garda, Sirmione, Limone, Torbole, Bardalino, Salo...and loads more! Info about the Dolomites and the beaches are also in this section, as are a variety of different maps. This includes a huge variety of things to do at and around the lake and is also geared towards those of you looking for activities to do with the family. It covers information on Gardaland & other themeparks, paddle boats, cycling, hiking, horseback riding, boat rentals, beauty centres, fishing, etc. There are a ton of sports in this area. Just to name a few of what you'll find here: Windsurfing, golf, tennis, cycling, sailing, waterskiing...Find out all about these and more in this section. We'll breifly go over how the lake formed and the stats on it, and tell you about past battles and ruins around the lake. This place has thousands of years of history for you to explore. Also, discover interesting facts about the lake, such as its' size and how deep the water is. This section gives stats on the monthly sunshine hours, temperatures and other weather related information. There's also info on things like water temperature and depths, as well as a current weather forecast. Our wonderful experiences of the mouth-watering Italian food have to be shared with you! We've even included a menu translater here. We'll also tell you about other amazing things like the local vineyards, wine, fruit and, of course, the famous ice cream (our favourite...yum!). We'll tell you why the shopping is so fabulous there. Everything from clothes, leather items, local art and crafts and markets to food shopping is covered here. There's also a size conversion chart that you can take with you! You'll find info here about the opera, shows, festivals and events in the area. The relaxed holiday atmosphere makes for some great entertainment experiences. Not been to Lago di Garda before? Take a look through this section to see if it's the type of holiday you are looking for. It helps if you come here knowing what to expect when you arrive! Look at some top tips and plan ahead to make sure your visit here is wonderful in every way. All you romantics out there will want to look at this section! Some slideshows giving you a flavour of what this beautiful lake has to offer. Exciting videos capturing some of the great sporting action you can enjoy around the lake. People come here and fall in love with this place (like us). Maybe after you've been here you'll want to buy a property in this beautiful part of Italy. Take a look at our complete site map, to help you navigate around this site. All pages are linked to the site map, so you are just a click awat from the page you want. The site map is listed in full and in section order. There's nothing more annoying than knowing you have seen a good page on a subject you're interested in, but can't find it again. Or maybe you can't be bothered reading loads of pages to try and find specific information. Not any more! Simply type in the word and site search brings you all the references found on this site, or a Google search if you want. A list of other travel related sites which you could find useful. It is nice to be kept up to date with the latest things going on in the area. Why not subscribe to our newsletter and always be the first to find out special offers, news and events here. All subscribers now get our exclusive Lake Garda free gifts (see Lake Garda news page for more details). I promise to use it only to send you Monthly newsletter. Think you can build a website like this one? We didn't think we could, until we discovered 'Solo Build It!' Find out how anyone can create a successful website, with no previous experience. We love getting your views and stories, so please drop us a message! Your feedback helps us to improve our website and we like to know what you found really useful too. Do you know what a blog is? Well a blog is a bite-sized journal which keeps you up to date with all the latest things happening on this site. Why not subscribe to our blog and you can immediately find out about any changes and additions we have made...or bring to your attention information which could be useful to you. 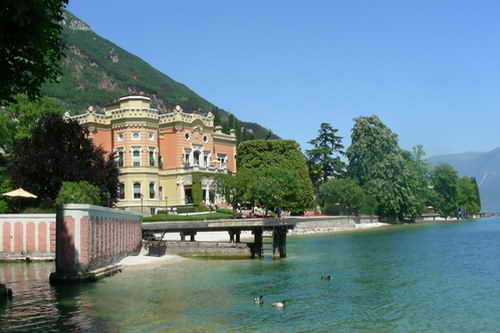 If you have a business which is related to Lake Garda, our highly targeted website could drive you lots of customers. We are highly ranked in Google searches and our site continues to grow significantly year on year. Discover how we can help you grow your business. Do you want something to remind you of a great time at Garda? Or maybe surprise a loved on with some designer Italian fashion items. Our easy to follow store has some great Italian gift ideas. Want to look at other "Revealed" websites? Why not go to Log Cabins Revealed!